Fitbaw (fae the Inglis association football), is a gemme or sport played by twa teams on a rectangular pairk (aboot 110 by 70 yaird) wi dales (24 by 8 feet) at the twa ends. The twa teams haes 11 players. 10 o the players rins aw ower the park an tries tae kick or heid the baw intae the ither team's dale but canna uise thair haunds. The ither player plays in the dale an is kent as the goalkeeper. The goalie uises his haunds in an 18 yaird box aboot the goal for tae stap the baw fae gaun in. The team that haes the maist goals efter 90 meenits wins the gemme. The players is gien a brek o 10 or 15 meenits at hauf time. 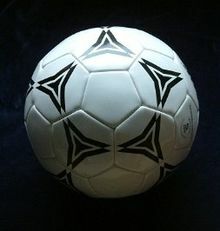 Fitbaw is the tap sport in maist pairts o the warld and is the maist popular sport in Scotland. Houaniver, in pairts o Sooth Asie like Indie an Pakistan, fitbaw is a hail sicht less popular nor cricket. In Canadae an the Unitit States, ither sports is mair popular: American fitbaw, basebaw, basketbaw, an ice hockey. In pairts o the Caribbean fitbaw is less popular nor basebaw (in Spainyie-speakin kintras) or cricket (in Inglis-speakin kintras). In monie kintras the best fitbaw players is gey famous an earns lairge amoonts o catter. Houaniver, acause fitbaw disna need muckle gear, it gets played by aw kynds o fowk for leisure as weel as for siller. FIFA's Warld Cup ilka fower year, is the maist popular sportin event efter the Olympic Gemmes. Scotland hae qualified a nummer o times, but hivna iver gotten past the group stages. The current champions are Germany, who wan the 2014 tournament in Brazil. UEFA's European Championship, or Euros as thay're maist weel-kent as, is ilka fower year. Portugal wan the 2016 tournament in Fraunce. The tap fourty-fower teams in Scotland plays athin the Scottish Professional Football League, wi the tap team in Scotland an aw plays athin the UEFA Champions League. The ither semi-pro teams plays athin the Highland League in northren Scotland, the East of Scotland League in an aboot Edinburgh an the Mairches, the South of Scotland League in Dumfries an Gallowa, an 'ithin the Scottish Junior Football Association. The Scots naitional fitbaw team plays at Hampden Park in Glesgae. Thair follaers is kent as the Tairtan Airmy. Pliyers canna uise thair haunds or airms (a haundbaw), cept the goalkeepers; the goalie can uise thaim 'ithin thair ain penalty area (thare is an 18 yaird boex aboot the goals at the tooooo ends o the park). Players canna trip or dunt ane anither (a foul). Players canna haud ane anither or hinder ither players gettin tae the baw (obstruction). If a player pits the baw oot o play at the side o the park, the ither team gets tae thraw the baw back intae play (a thraw in). The affside rule staps a player fae kickin or heidin the baw tae a teammate that juist haes the ither team's goalkeeper atween him an the goal. Wikimedia Commons haes media relatit tae Association football. This page wis last eeditit on 3 Julie 2018, at 03:54.